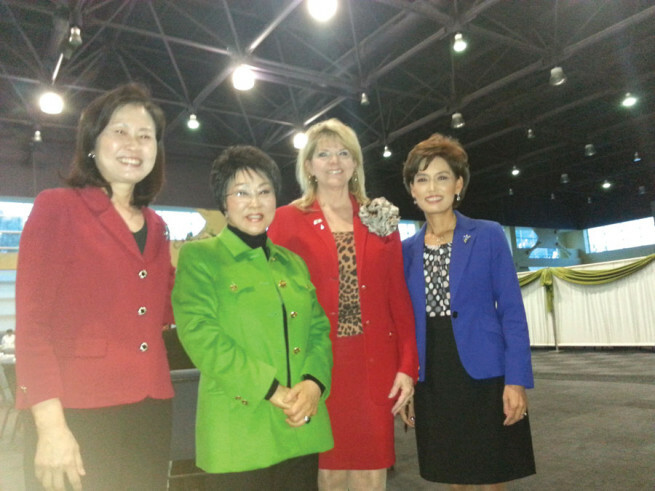 FULLERTON – Republican National Committee Co-Chair Sharon Day met with Asian and Pacific Americans earlier this month, continuing the GOPs strategy to strengthen their ties in the Asian American community. The Washington DC-based Republican Day hosted a roundtable with Asian American women and a small press conference at the Grace Ministries in Fullerton. Day told the more than 50 Asian Americans at the event that it’s about time Republicans build a “long-lasting” relationship with the community. Seeing the changing demographic landscape of the United States and facing possible defeat in future elections, the Republican National Committee after the 2012 election released a scathing self-analysis report aimed to modernize the party and fix the perception and lack of appeal in minority communities such as Latino, African Americans, Asian Americans, women and young voters. “It is time to smartly change course, modernize the Party, and learn once again how to appeal to more people, including those who share some but not all of our conservative principles,” the 100-page Growth and Opportunity Project report states. Since releasing the report, the GOP has stressed an importance on reaching out to an Asian American demographic — the fastest growing ethnic group in the US and whom the Republicans believe shares many traditional commonalities with them. The RNC has hired at least three Asian Americans in California to help build their relationship with the community. Day said Republicans have a lot in common with Asian Americans. She cited entrepreneurship, high emphasis on education, religion, health and family as some of those commonalities. Mei Mei Huff, Asian American Republican political strategist and wife of California State Senate Republican Minority Leader Bob Huff, said Republicans can no longer afford to neglect Asian American voters. Mei Mei, who has helped build her husband’s campaign in the Asian American community, said Asian Americans need to feel engage with their Republican representative or potential Republican candidate. During her years helping Republican campaigns, she recalls seeing some Republican candidates attend an Asian American community function, only to drop off some leaflets before leaving. It can’t be like that anymore, she said. Bob Huff credits his political success to his relationship with the Asian American community in Diamond Bar, which he represents.